Generally, vehicles, equipments and infrastructures are considered separately in studies dealing with transport and mobility. However these infrastructures (roads, waterways, harbors, airport, bike paths…) are essential to the physical conditions of traffic in all modes of transport (coaches, cars, buses, boats, planes…). Looking at mobility from the perspective of material culture is a way of articulating these two dimensions and of approaching infrastructure and means of transport based on the most concrete and visible aspects. This mobility history conference aims to bridge research approaches, welcoming proposals from different disciplines dealing with mobility studies (history, sociology, anthropology, geography, economy, planning studies, business history, architecture, design, communication, archeology, etc.) We particularly encourage the submission of interdisciplinary panels or sessions. Individual paper proposals must include summary in english no longer than a half page (300 words) and a short 100/150-words biographical note (with indication of academic title or professional position, adress and e-mail address). For a session, please send a general presentation (300 words), an abstract of each paper (300 words maximum) and a short 100/150-words biographical note for each speaker. The organisation of the Congress brings together a wide array of public and private institutions. The Congress will be held at the Paris I Panthéon-Sorbonne University and at Mondial.Tech. The scientific committee is made up of : Anne Conchon (Chair of the Committee, Paris I Panthéon-Sorbonne University), Mathieu Flonneau (vice-chair of the Committee, Paris I Panthéon-Sorbonne University), Etienne Faugier (Associate researcher, LARHRA), Alice Milor (Sorbonne University), Laurence Nye (Sorbonne University), Dhan Zunino Singh (Universidad de Quilmes), Martin Emanuel (Higher School of Economics, St. Petersburg), Victor Marquez (Independent Scholar, Mexico), Pierre Barrieau (UQAM). The Local Organisational Committee is made up of : Anne Conchon (Chair of the Committee, Paris I Panthéon-Sorbonne University), Mathieu Flonneau (vice-chair of the Committee, Paris I Panthéon-Sorbonne University), Etienne Faugier (Associate researcher, LARHRA), Anne-Marie Checcozzo (FIEV), Stéphane Levesque (URF), Stève Bernardin (Marne-la-Vallée University), Yves Bouvier (Sorbonne University), Aurélien Delpirou (Ecole d’urbanisme de Paris / Lab’Urba), Jean-François Doulet (Paris-Est Créteil Val-de-Marne University), Caroline Gallez (IFSTTAR), Vincent Guigueno (Quai Branly Museum), Maxime Huré (Perpignan University), Laurence Nye (Sorbonne University), Arnaud Passalacqua (Paris Diderot University), Sébastien Richez (Postal History committee), Nathalie Roseau (Ecole des Ponts Paris Tech), Florence Brachet Champsaur (Railways and History), Louis Baldasseroni (Marne-la-Vallée University), Alice Milor (Sorbonne University), Guillaume Kozubski (FFC), Nicolas Hautière (IFSTTAR), Marc Desportes (History Committee of MTES), Marie-Noelle Polino (Politic responsible of patrimonial groups and Association), Julien Vick (Road Equipment Association), Pierre-Louis Debar (CCFA), Michele Muhlmann-Weill (Automobile Club Association). If ‘all that is solid melts into air’, it is in large part because movement has become the organizing principal characteristic of modern times. The multiplicity of expressions that mobility adopts, including the immobile infrastructure that supports it, suggest that we inhabit a world in flux, made up of inter-spaces where groups of people, objects, and ideas converge and disperse with great rapidity. How can we understand the actual trajectories, movements, and directions of these movements? What do the ‘mobilities turn’ and the ‘consciousness of a mobile world’ mean, and how do they help us better to make sense of our condition as mobile subjects? 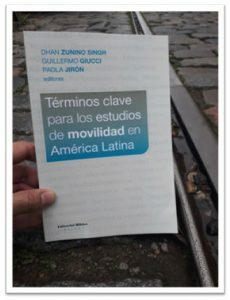 This handbook, the first of its kind to appear in the Spanish language, seeks to provide some preliminary answers to these questions, particularly in the context of contemporary mobilities in Latin America. A collaborative effort from a diverse group of researchers, largely from Latin America itself, but also including scholars based in Europe and North America, the handbook invites readers to enter the field of mobilities through twenty two terms, which deploy, combine, and develop approaches from a range of disciplines including sociology, anthropology, history, geography, architecture, engineering, and literature, and engage with current scholarship in urban studies, transport, the environment, migration, and tourism. This selection is a pertinent approximation that offers a roadmap of concepts, debates, themes, and phenomena around mobility. Keywords: accessibility and daily mobility, aeromobility, automobility, walking, circulation, right to mobility, gender, immobility, placing in motion, migration, moving with objetcs, children mobility, residential mobility, mobility and tourism, passengers, performance, networks, rhythm, road safety, transport, sustainable transport, travel.